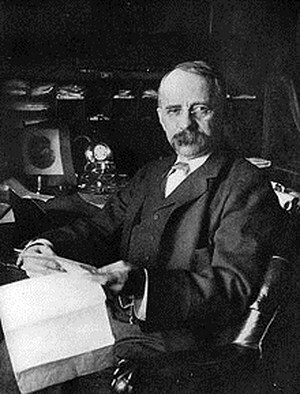 Edward Henry Harriman 1848 – 1909 was an American Railroad executive who got his first experience with railroads here in Sodus Point. The Harrimans lived for a year or two in the old yellow Lummis residence with white pillars now owned by Tom and Martha Lightfoot. Harriman was born in Hempstead, New York, the son of Orlando Harriman, an Episcopal clergyman, and Cornelia Neilson. His great-grandfather, William Harriman, emigrated from England in 1795 and engaged successfully in trading and commercial pursuits. As a young boy, Harriman spent a summer working at the Greenwood Iron Furnace in the area owned by the Robert Parket Parrott family that would become Harriman State Park. He quit school at age 14 to take a job as an errand boy on Wall Street in New York City. His uncle Oliver Harriman had earlier established a career there. His rise from that humble station was meteoric. By age 22, he was a member of the New York Stock Exchange. And, by age 33, he focused his energies on acquiring rail lines. them he believed that it might profitably be sold. In the fall of 1881, therefore, he, with S. J. Macy, of New York, and others, bought the interest of William Alexander Smith in the property, and about a year later reorganized the company as the “Sodus Bay & Southern,” with Macy as president and Harriman as vice-president. This was the turning-point in the fortunes of the road. Betterments were soon undertaken, new equipment was bought, and in April, 1882, Mr. Harriman, in order to encourage the grain traffic and thus increase the road’s business, incorporated the “Sodus Bay Elevator Company” and proceeded to erect a grain elevator on Sodus Point. Before the fall of 1883, the physical condition of the road had been much improved, but its business was still unprofitable, and Mr. Harriman became satisfied that in order to do what he wished to do with the property, he would have to get complete control of it. At a meeting, therefore, of the board of directors in October, 1883, he named a price at which he would either sell his own stock, or buy the stock of the other owners. The price was a fair one, and nearly all of the principal shareholders, discouraged by President Macy’s last report on traffic and earnings, decided to sell. Mr. Harriman thus became practically the sole owner of the property. He immediately reorganized the directorate, had himself elected president in place of Mr. Macy, and substituted George H. Strauss for Silas Stuart as superintendent or general manager. Before the 1st of June in the following year, the road (already much improved) had been put in firstclass condition, and Mr. Harriman, in pursuance of his original intention, offered it for sale to both the Pennsylvania and the New York Central. In making his proposition to the former, Harriman pointed out the desirability of extending the Northern Central to Sodus Bay and thus getting an outlet on Lake Ontario for the coal of the Pennsylvania fields which, he thought, might be sold largely and profitably in Canada. With the Vanderbilt interests, on the other hand, he used the argument that if the New York Central did not buy the road the Pennsylvania undoubtedly would, and that it was sound railroad policy to keep a rival from acquiring it, even if the Central itself did not particularly need it. Great Sodus Bay, he urged, was the best harbor on the southern shore of Lake Ontario, and the railroad that controlled it would have a great advantage over any other line in competition for the rapidly increasing trade of Canada. At the time of his death Harriman controlled the Union Pacific, the Southern Pacific, the Saint Josph and Grand Island, the Illinois Central, the Central Of Georgia, the Pacific Mail Steamship Company, and the Wells Fargo Express Company. Estimates of his estate ranged from $70 million to $100 million. It was left entirely to his wife. Harriman was a notable philanthropist, and founder of the Tompkins’ Square Boys’ Club, now known as The Boys Club of New York. The family’s kind donation of a parcel of land would eventually become the Harriman Park and Public boat launch on route 14 in Sodus Point used by thousands of fishermen each year to access Sodus Bay.